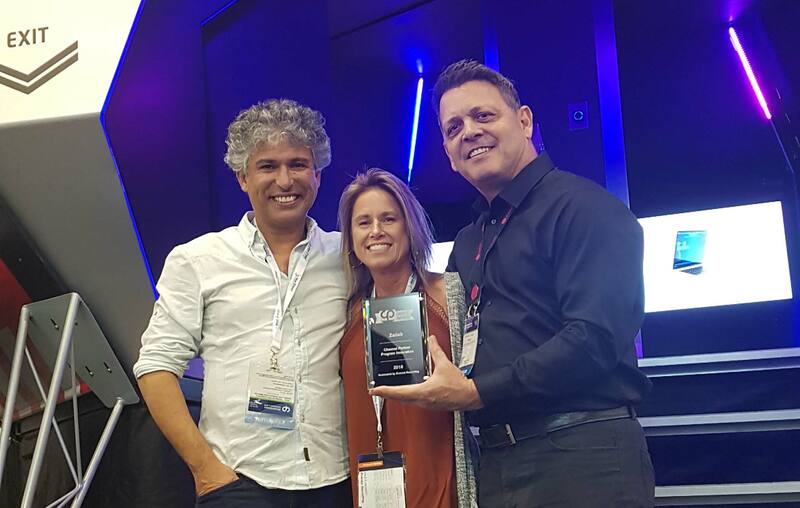 Last night, the company scored two wins at the Channel Partners Conference & Expo Awards, held in The Channel Partners Studio in the expo hall of Mandalay Bay in Las Vegas. On Thursday, April 11th, 2019, Channel Partners announced the winners of its 2019 Best in Show, Channel Maker and Channel Partners Choice Awards, which recognized exhibitors and suppliers at the Channel Partners Conference & Expo. Zailab was a first-time exhibitor at the event, which is the largest dedicated channel event for agents, MSPs, VARS, and suppliers of its kind. Zailab won two awards at the presentation ceremony – The Best New Exhibitor award and a Channel Partners Choice award. Zailab founder and CEO Nour Addine Ayyoub was present to accept both awards. In The Best in Show category, Zailab was the winner of the Best New Exhibitor award. Our 20×20 stand was defined by The Lander, a space-themed installation created by Zailab’s industrial design team. Inside, visitors were treated to a video and light show experience that told the story of Zailab’s maverick beginnings. Read more about The Lander, here. Later on in the ceremony, we won one of several Channel Partners Choice awards, a partner-nominated category that recognizes innovations in channel programs. Zailab was nominated by Everest Recruiting. Zailab, a 100% channel-focused supplier, is a competitive product offering for resellers looking to add a cost-effective cloud solution to their portfolios. These awards highlight the fact that Zailab’s maverick approach is making an impression in the channel space, and indicate that many more meaningful relationships with partners are sure to follow. View the full list of Channel Partners Awards winners here. Next PostWhat Makes A Great Supervisor?